England carried on with a perfect day , as followed by total demolition process on the Boxing day where Aussies were bundled out for 98. 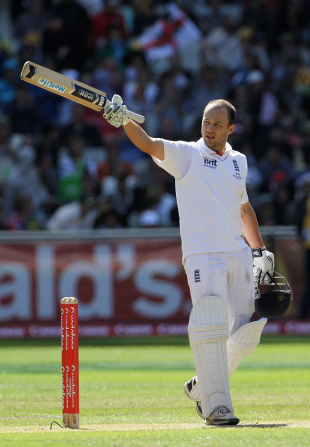 Jonathan Trott was the star of the day as he led total dominance at WACA , who at stumps was unbeaten at 141 with wicket-keeper Matt Prior with him at 75, as England cruised to 444-5.This in a result extended their lead to a staggering 346, with England sensing Ashes coming their way. England's first innings lead of 346 is their third highest in all Tests at the MCG. On the other hand , Ricky Ponting did not have very happiest of days, as he finally felt the heavy toll he had been going through. In process has been fined 40% of his match fee and was rebuked severly by match referee Ranjan Madugalle. This all came when he had some heated discussion with Pakistani umpire Aleem Dar, who is known for cool composure,Tony Hill and Kevin Pietersen. Ryan Harris appealed for a caught behind appeal for Pietersen who was on 49 which was overturned by Dar ,which was correctly adjudged on a caught behind referral.The umpires reviewed footage at the close of play before filing a report to the ICC, in which Ponting pleaded guilty to a Level 1of the code of conduct, which relates to "Arguing or entering into a prolonged discussion with the umpire about his decision." England resuming their innings at 157-0, lost early wickets in the morning with Cook who was the first victim got out for 82. Later at 170 Captain Andrew Strauss went back to pavillion. Both were removed by Siddle.Then Pietersen along with Jonathan Trott extended their lead, when finally Pietersen was plumb lbw off the bowling of Siddle. This was the first dismissal in this Boxing day test match , when catching was not involved in the dissmals. After that Australia had their part of the session with Collingwood and Ian Bell who got our cheaply. But then the English keeper consolidated, and built up partnership with Trott. Australia's misery took a worse U-turn when Prior who before tea had edged on the bowling was called back when he was called back by Aleem Dar as he suspected that Johnson had overstepped. A quick consultation with the third official showed Johnson had indeed delivered a no-ball. This led Trott- Prior partnership rising to a formidable 158 runs. With such exceptional proceedings taken on by England, they not like to take things away from them, and would like to wrap up this Test match with style.